Most people know that mold is not good for them or their homes. However, few people realize the specific health risks associated with mold exposure. Mold exposure can come with a variety of symptoms and illnesses. Learn about the many negative effects of breathing in mold. Mold isn’t stationary. As mold grows, it produces airborne substances. Those substances can be allergens that cause discomfort and illness for individuals sensitive to the allergens. Allergens are the most common cause of the side effects that come with breathing in mold. But it’s not only allergens that can be detrimental to your health. In addition to producing allergens, mold can also produce mycotoxins. Although the mold itself isn’t toxic, the mycotoxins are. They can cause a variety of health issues. In extreme cases, they can cause death. Not all types of mold produce mycotoxins. Even mold that has the potential to produce them might not do so. You could live with toxic mold and not experience health issues. However, the potential is there. Researchers are still trying to understand what makes toxic mold produce mycotoxins. Furthermore, they are trying to understand why certain individuals are so sensitive to allergens and mycotoxins. Negative reactions to mold can happen at any time. Sometimes, they occur immediately after exposure. However, they can also occur long after exposure. If you experience any of the common symptoms associated with mold exposure, you should consider testing your home for mold. You might not see any mold, but it can still be lurking in the shadows. Many of the effects of breathing in mold relate to your respiratory system. For example, sneezing, runny nose, coughing, and wheezing are common effects of mold allergens exposure. For some people, mold exposure is similar to a cold. However, instead of getting better, the cold persists. Mold can also affect your eyes. You might experience watering eyes, red eyes, or itchy eyes. In some situations, you could develop a rash or skin irritation. While some people only have one symptom from mold exposure, others have multiple symptoms. If you are allergic to mold or have asthma, you could have an asthmatic attack after exposure to mold. However, you don’t need to be asthmatic or allergic to experience some of the symptoms listed above. It’s not uncommon for individuals with no history of allergies to have rashes or respiratory issues after mold exposure. Unfortunately, reactions to mold exposure aren’t always mild. Some people experience severe reactions. This includes a fever and trouble breathing. If you have chronic lung disease or a weakened immune system, you are more likely to have a severe reaction. After mold exposure, you could develop a fungal infection. 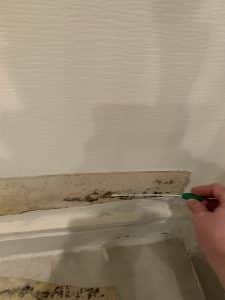 It’s impossible to say how you will react to mold. Certain types of mold tend to incite more severe reactions than others. Additionally, your own genetic makeup can impact the way in which a mold affects you. The amount of mold present can also influence the severity of the symptoms. There is an abundance of anecdotal evidence that shows the effects of breathing in mold. But if you want scientific evidence, you don’t need to spend too much time researching. In 2009, the Institute of Medicine reported that there was enough evidence to connect inside mold exposure to coughing, wheezing, and upper respiratory symptoms in healthy individuals. Although the report denied that there was any evidence linking mold and asthma in healthy people, it did confirm that mold worsens asthma in those who already suffer from asthma. The report also stated that mold is connected to hypersensitivity pneumonitis in people who are susceptible to the illness. As uncommon as hypersensitivity pneumonitis might be, it can occur after extended mold exposure. If you suffer from the effects of breathing in mold, you might have questions about its treatment. Allergic reactions to mold are simple to treat. You treat them in the same way you would treat other allergic reactions. However, fungal infections from mold exposure require more serious treatment. If the infection spreads through your body, you need to be hospitalized. The doctors must treat the infections with antifungal drugs. Additionally, they need to perform procedures to help your body circulate your blood and breathe. If you have asthma as a result of mold exposure, the treatment methods vary. There are several effective asthma treatments. The type of treatment you receive depends on your symptoms and the severity of your asthma. What Should You Do If You Experience Symptoms? If you experience symptoms of mold exposure, you should see a doctor. But that’s only your first step. You should also have an expert test your home for mold. Going to a doctor but failing to test your home for mold is only a bandaid. Although a doctor can treat your symptoms, he can’t do anything about your mold problem. The issue will only persist. You will likely continue to experience symptoms of breathing in mold. When you work with a mold technician, you can find out whether or not you have mold in your home. You can also determine the type of mold you have and the quantity. Once you have this information, you can be on your way to treating the problem. Removing mold from your home is no easy task. As such, it’s not one that you should take on yourself. Mold removal can be quite dangerous. If you fail to wear the proper safety equipment, you could experience worsened symptoms of mold exposure. You could also fail to remove all of the mold. Even a little mold can cause significant discomfort. And a little mold can quickly become a lot of mold. If you have any mold in your home, you should work with a mold removal technician. When you do, you can get the peace of mind that your home is free of mold. You can breathe easy thanks to a mold removal company in Houston.